Aria Force....winching, walling and revetment work. A fallen Wellingtonia tree at Aira Force needed to be winched upright in order tidy up the root plate. The upturned root plate is a bit of an eyesore especially as it is close to the popular path leading up to Aira Force. Although most of the tree had already been cut up, enough of the trunk was left intact to allow for leverage. Going up. Nic can be seen, centre left, manning the heavy duty winch. With the tree upright again it can now be felled leaving a tidy stump. The trunk can now be cut up and removed. Next job is the nearby wall. The image above is of the tumble down wall that overlooks Aira Beck. The main beam of the water heck is in the foreground. Not the easiest kind of wall to rebuild as it consists mainly of "beck stones" which are large irregular shaped cobbles. Care was needed in building the coyne end; there was a steep drop into Aira Beck to contend with! Breaking up stone to make filler or hearting for the inside of the wall. Without sufficient filler the wall will fall in on itself. Getting close to a finish. An attempt at a panoramic shot from the bridge. Some erosion had occurred on the banks of a small beck that flows into Aira Beck. Revetement work was decided upon. Ray and Nic unloading a large boulder for the revetment. Top soil will be put in behind the stone at a later date. Nic bringing in more stone for the revetment wall on the other side of the beck. The power barrow proving invaluable for the work. All in all a productive 2 days with plenty of opportunities to chat about the work in progress to the many interested people on their way to and from the waterfall. New look signs for bygone times. 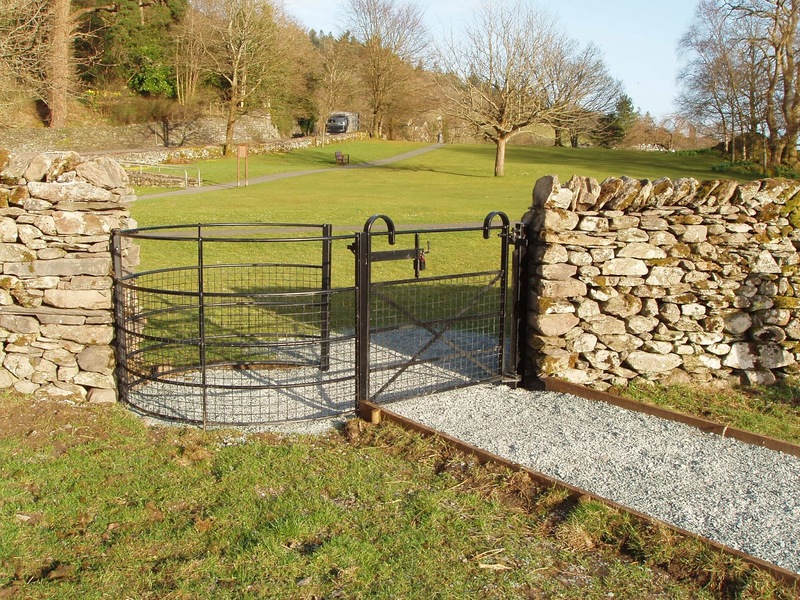 Fresh interpretation and a reminder of the work done at Ambleside Roman Fort. 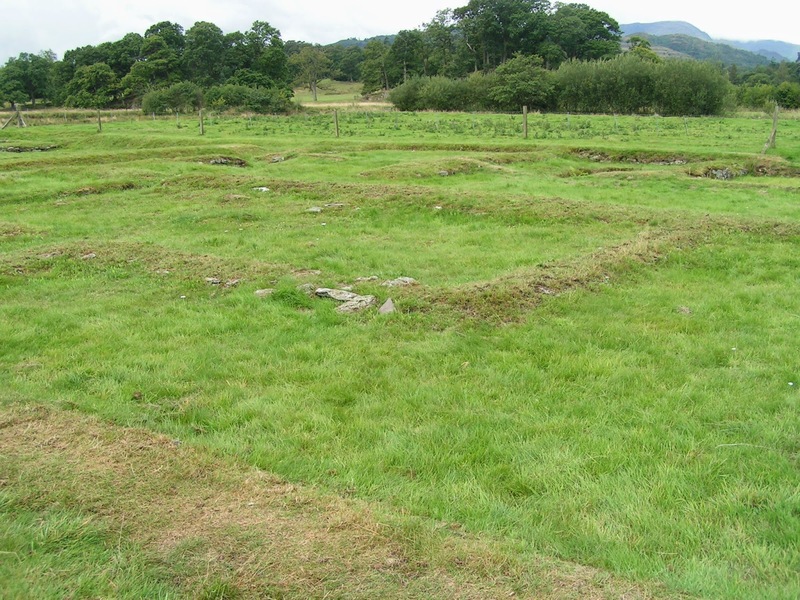 Ambleside Roman Fort, (aka... Galava), is situated at the northern end of Windermere. It is understood to have been built in the second century during Hadrian's reign. 500 infantry men (a cohort) were stationed there to guard the road between Brocavum (Brougham) and Glannaventa (Ravenglass). With its large granaries, the fort was likely to have been used as a supply base. Over the course of two weeks in the summers of 2011 and 2012, teams of volunteers, NT conservation builders, NT rangers and archaeologists worked together to consolidate the remains of the fort. Windermere Reflections provided funding for the entire project so thanks to them the work was able to go ahead. The indistinct foundations prior to consolidation work. turf covering the low walls that remain of the fort. stones as seen in the left hand side of the image. scars on the lake shore. made from crushed rock with burnt lime used as a binder. Celebrating after completing the work. gives a clearer indication of how the fort was laid out. put in place splendid new interpretation signs. The signs newly arrived at Borrans Barn. of protective teak oil before installation. which the old signs were mounted. overloading the trailer only two were taken away at a time. Digging holes for one of the larger signs. are about to replace the turf around its base. The first visitors arrive to have a look. with many more people visiting the Roman Fort. land and 2 signs on SLDC land at Borrans Park. Following on from my Cows + Trees = Wood Pasture blog last year, this update describes how the work is progressing in Ullswater to restore an area of ancient wood pasture; the monster machinery being used and the discovery of a Champion amongst the forest. High up above Gowbarrow, looking down Ullswater. Wood pasture is, on a European scale, a very important habitat for biodiversity due to the ancient open grown trees that are found within it. These trees can only grow to this size if given the space, and without competition (which woodland trees suffer from) should live to a very old age giving incredible continuity of habitat. Wood pasture is grazed land, generally upland and rougher, but definitely unimproved (ie not been fertilised). This gives a very diverse range of sun-loving plants growing between the trees. Grazing is best done with traditional breeds of hardy cows as their eating habits give a variety of heights and plant species and the bovine numbers are kept low to allow tree regeneration to happen, but not so much that a closed canopy woodland will develop. This habitat, which Franz Vera (2000) describes as savannah is what Britain looked like before Neolithic man had his influence. Wall-to-wall tree cover over the UK was not the case. Wood pasture habitat where above is found = very important, in Europe. A view of Gowbarrow Park SSSI taken from Gowbarrow fell. In the foreground is Collier Hag, behind it Stalking House and to the right - towards the lake - is alder dominated wood pasture. Contractors have started to fell the conifer plantations which were planted in the 60's at New Planting, Collier Hag, Stalking House and Yew Crag plantations. This is around 12ha of mixed conifers such as Japanese larch, hybrid larch, Norway spruce, western hemlock and douglas fir along with some broadleaf 'non-natives' such as sycamore, beech and nothofagus (southern beech). The conifer element adds up to at least 3,500m3 of saleable timber to be removed, and to give a comparison, an Olympic sized swimming pool holds about 2,500m3 of water. Clearing an access route through Collier Hag to get to Stalking House which was felled off first. We shall be retaining a few so called non-natives to become open grown and provide further habitat niches. With the possibly of climate change having a big impact on some native tree species, it might be wise to keep some more exotic species, just in case. Some conifers will however remain; Scots pine -a native - will be left in places and some lovely open grown larch trees with their twisted, lichen covered branches will also be kept. New Planting after conifer removal, showing plenty of native trees which can now grow to maturity. The plantations are islands, or PAWP (Plantations on Ancient Wood Pasture, as I call them) within a site designated as SSSI by Natural England for its wet woodland and ancient wood pasture habitat. Our hope is that over time the areas where conifers once stood will, by natural regeneration (nat regen), not become woodland but a savannah - a mix of widely spaced trees and sun loving plants, open areas and shaded areas, veteran trees and young saplings. Once this has happened the former PAWP areas can be coloured in to complete the SSSI site as a whole 50ha chunk, 12ha of it (24%!) having been restored. A benefit of access to the plantations was the 'bashing' of bracken by the harvester. We expect alder to colonise this strip quite rapidly. The PAWP areas won't look like big brown scars on the landscape, because the NT has over the years been thinning parts of the plantations and slowly opening up native and veteran trees which were surrounded by conifers or non-natives and getting shaded out. The ground has some floristic diversity (herbs, mosses, ferns) already and the historic thinning work has created some nice sunny glades. Oak trees retained in the foreground and larch being taken out behind - their stumps already hidden by bracken, bramble and brash. Many excellent ancient (over 400 years old) and veteran (full of wildlife features such as holes, cracks etc) trees are on the PAWP sites and a surprising amount of natural tree regen already exists, with oak, rowan, birch and hawthorn just waiting for the day when the conifer barrier is removed from their view. Luckily the ancient trees have had the conifers thinned around them over the years - called halo thinning - so they won't be suddenly shocked by intense heat and light of the sun, or blow over in the next gale. A veteran ash tree within Collier Hag. Halo thinning has kept this tree open and healthy. Big trees and lots of them meant big machines to enable the timber to be removed off site quickly and easily. The plantations are non-designated islands within the designated SSSI so working with big machines in the conifers was perfectly acceptable. In some cases a big machine can cause less damage as it has the power to get around and not get stuck. An under-powered machine can cause a lot of damage as it churns up the ground trying to drive around and shift heavy loads of timber. Despite the size and capability of these monsters the weather was still a big factor, and to avoid ground damage in wet weather the machines would not be used until conditions were dry enough again. Looking at the business end of a harvester. Specialist equipment fit for the job. A Valtra tractor with a roof-mounted grab and forwarder trailer. A skidder, for winching and dragging long lengths of (unconverted) timber down to a level site. Once at the roadside, the converted lengths of timber are loaded up and taken away to sawmills. Removing the conifers is only part of the story - to complete this restoration a great amount of work needs to be done on removing old boundaries. A person who worked with trees in a woodland was called a Collier. The name Collier Hag plantation at Gowbarrow Park suggests a woodland (before the conifers were planted) which was worked for a living by people who might have made charcoal from the coppiced alder trees. The wood was burned without air to make charcoal on flat excavations now called charcoal hearths. These hearths are important archaeological sites and are protected from damage. We fenced off three known charcoal hearths at the New Planting site so that forestry operations did not damage this historic woodland archaeology. The site of a historic charcoal hearth, marked out prior to work starting. The wet ground at Gowbarrow Park is perfect for alder trees which like to have their roots wet all year round. Alder wood is particularly good for the production of charcoal, which was transported around the Lakes to lime kilns for the production of quick-lime. Alder is a great coppice tree which means it can be repeatedly cut down and regrown - and at Gowbarow Park there are large remnants of these coppiced areas called coupes. But what about excavations carried out today for woodland management? At New Planting a large flat area was created to convert (cut into short lengths) timber ready to be taken to a stacking area by the road. Does this new converting area count as woodland archaeology? If left would experts in 150 years time be protecting this from damage?! A 10x25m flat area was excavated in a bracken bed at New Planting. Is this creation of woodland archaeology? Whilst out marking trees I came across this magnificent sweet chestnut tree high up in a far corner of the SSSI site. Measuring possibly 30m high and 122cm wide this might in fact be a new county champion in terms of its height. To be sure I will be looking on the Champion Tree Database on the Tree Register web site and hopefully someone will be able to verify the measurements. I'm confident we have another champion tree to add to our already big list of 46 Champion Trees for the Windermere, Troutbeck, Ullswater, Grasmere & Langdale area....but watch this space to find out if it really is! Volunteer surveyor - David - stood next to the huge sweet chestnut tree found above Stalking House plantation. A view of the sweet chestnut which could be up to 30m high - a county champion. Look out for Part 3 of this series which will be focussing on the wildlife at Gowbarrow Park SSSI. If you go down to the woods today…. You’re sure to come across a giant Red Squirrel. Maybe not quite as big as this one, but if you’re lucky you might just catch sight of one of these small endangered species. But if you don’t manage to get a glimpse of one, why not take part in our red squirrel trail and help Cyril find the clues to his quiz. The trail is available throughout the summer holidays. Just call into the National Trust shop in the main Aira Force car park for further details. Our sales assistants will be happy to help. The walk will take approximately 40m-1hr, depending on how good you are at spotting the clues. The walk also takes in the magnificent Aira Force waterfall which stands at a resplendent 65ft. 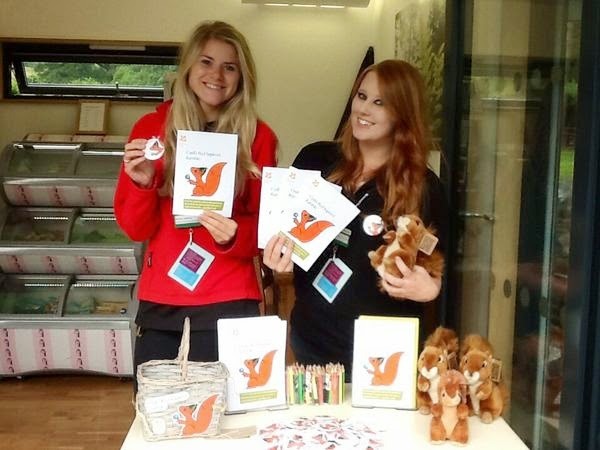 Not only will you win a prize if you manage to help Cyril solve all his clues, but you will have also helped towards the conservation of the red squirrels in the Ullswater area (all proceeds from the trail go towards food for the squirrels). Fun for all ages. So if you find yourself at a loose end these summer holidays, why not come down to Aira Force and see if you can spot Cyril. 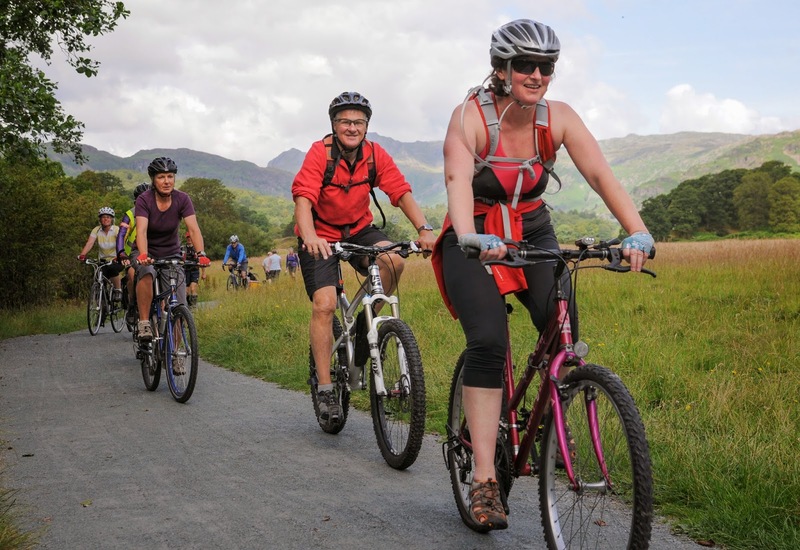 National Trust staff in the Lakes jump on their bikes to launch a brand new cycle trail in Langdale. The event saw the official opening of a new 5 mile cycle route to Langdale, supported by the £6.9million GoLakes Travel programme. 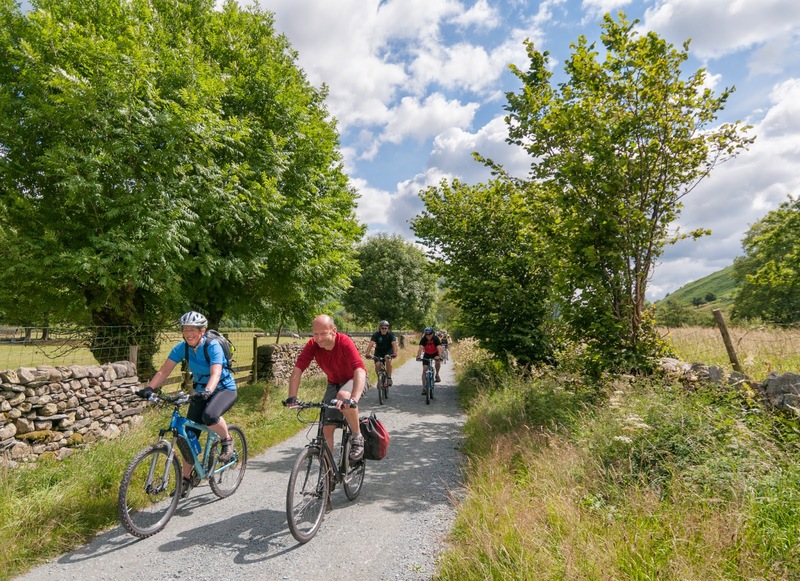 Virtually all off-road, it expands the cycling network around the northern end of Windermere and complements other recent two-wheeled developments including the gentle western shore route and the newly introduced 'bike boat'. It was a great day - the merry band of cyclists took in Ambleside and Skelwith Bridge before riding through to Elterwater and onto the Langdale Valley. The beautiful scenery and thoughts of a pub lunch at Sticklebarn at the end of the ride kept everyone moving along the 5 mile route. 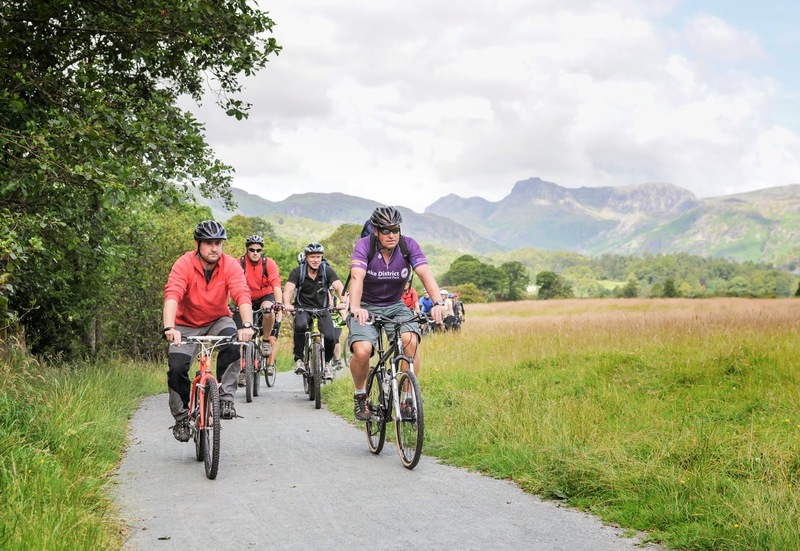 David Robinson, Access and Recreation Developer with the Lake District National Park Authority, said: "What a fantastic way to celebrate the work we've done through the GoLakes Travel Programme to open up Langdale for leisure cycling. 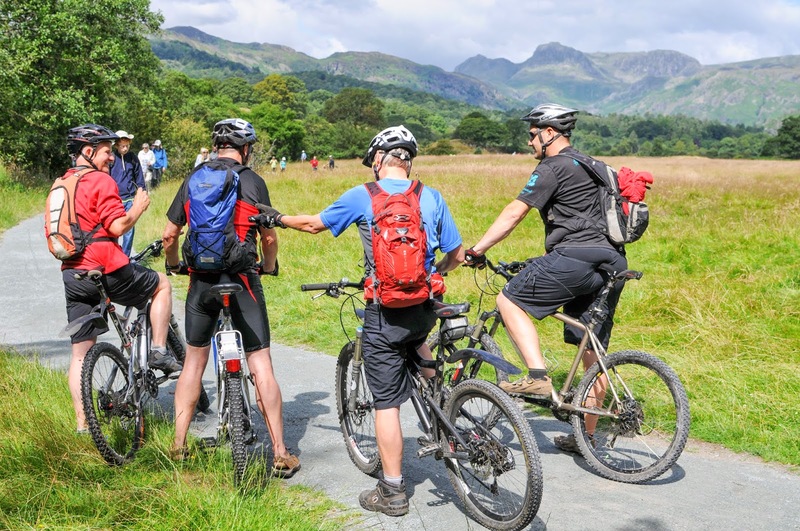 Before the new trail, people couldn't really cycle along the scenic route between Elterwater and Dungeon Ghyll without either having a mountain bike or going on the road, so this is a great, way for people to safely cycle one of the Lake District's most iconic valleys." 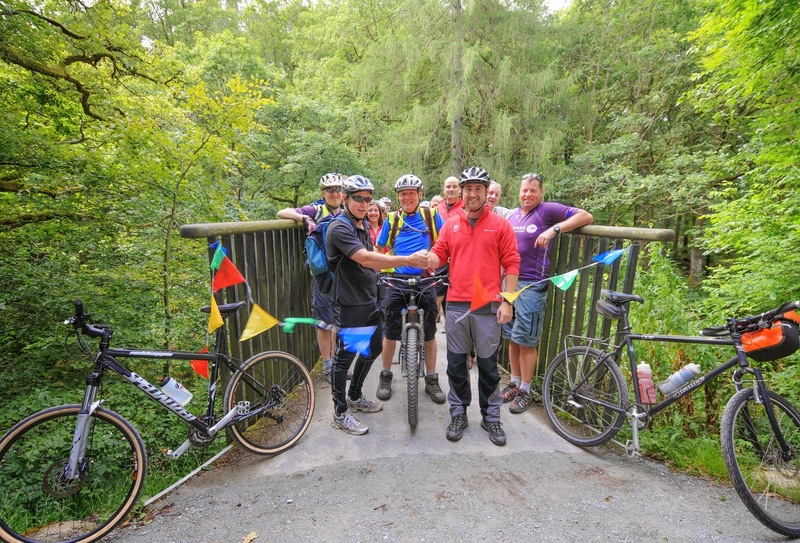 Among the intrepid cyclists was Neil Winder, Ranger for the Langdale Valley, who cut the ribbon to officially open the trail. He said: "This route's got the lot - wonderful woodland, lakeshore and the dramatic Langdale fells - and it's traffic-free. Leaving the car behind is good for your health, a great day out for the kids and fewer car journeys are brilliant for keeping the Lakes special, for ever, for everyone." Click the link below to see one young man all smiles in Langdale.